How much? This is Brisbane’s most expensive rental property ?!?! A YOUNG Brisbane entrepreneur is forking out 13 times the average weekly rent to live a life of luxury in one of the city’s most lusted-after mega mansions. For the princely sum of $5500 a week, the house described as “the trophy home of the decade” is the most expensive rental ever achieved in the river city, according to the Residential Tenancies Authority. You could rent 13 houses for the price 10 Morgan Street, Ascot, has been leased for, based on the median weekly rent in Brisbane being $415, according to property researcher CoreLogic. It is also nearly three times the average monthly mortgage repayment. But Joy Crossingham, the owner of eyelash extension supplier, LashJoy, also operates part of the business from the house. The ultra-private, luxury residence is built into the side of Bartley’s Hill and spans four levels, with more than 1470 sqm of living space. The home has five bedrooms, six bathrooms, space for 10 cars and killer views. For $5500 a week, you also get a commercial grade marble kitchen, an infinity lap pool, oversized bar and entertaining area, a climate-controlled wine cellar, a private gym, shower and steam room, and an internal lift. Eadan Hockings of LivingHere, who leased the property, said his research showed it was the highest rental price achieved for a residential home in Brisbane. 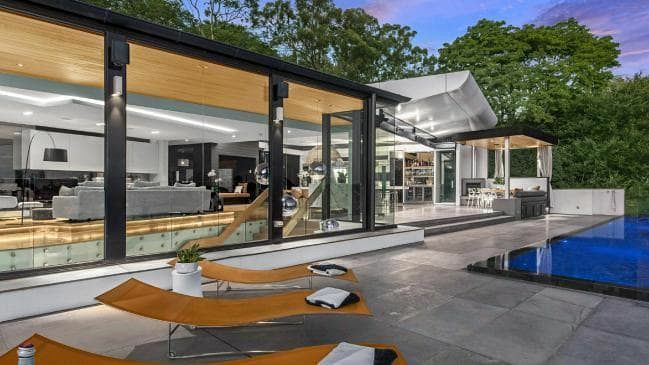 The house that disgraced businessman Christopher Skase built in Hamilton was advertised for rent for an eyewatering $12,800 a week before it sold last year, making it Queensland’s most expensive advertised rental. But Mr Hockings said the closest price for a secured rental in Brisbane, after 10 Morgan Street, was $3800. “We’ve seen an influx of tenants with $4000 plus per week to spend as a result of this landmark rental,” Mr Hockings said. But Mr Hockings said he was expecting to see several rentals secured in that price range in the first quarter of this year. “We’re dealing with a lot of people who, if they can’t find a place to buy, are often happy to put down up to $250,000 a year in rent,” he said. It comes as rents in Brisbane are on the rise, with research by realestate.com.au showing house rents increased 2.4 per cent in 2018, while the cost of leasing a unit became 2.6 per cent more expensive. Realestate.com.au chief economist Nerida Conisbee said the only way was up for rents in the city from here on, as underlying demand in the Brisbane market began to absorb rental supply, putting upward pressure on rents.